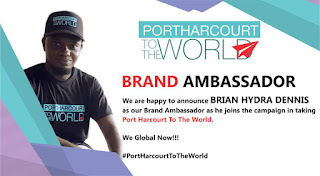 Port-Harcourt To The World,A media and events brand aimed at showcasing the entertainment activities of the oil rich state and the entire Niger Delta to the rest of the world has set another milestone as it has announced the signing of another new brand ambassador. This is coming barely a week after signing ex Big brother naija (Bbn housemate)Angel Awotarigha as its first official brand ambassador. Bryan Dennis is a communications consultant and branding adviser. He grew up in the city of Port-Harcourt and has been working with so many brands in the city over the years. In an official statement released by Port-Harcourt To the word,Bryan Dennis stated that he is very excited to be an ambassador to the brand and that he is very much commited to the project"
"The Man of the moment is Brian Hydra Dennis! He signed up with us!!! Brian Hydra Dennis is a Strategic Communications Consultant, a writer, a social media influencer and Business development and Branding Adviser. Hydra was born and raised in Port Harcourt and provides strategic offerings to several Port Harcourt based companies.